Wall, NJ: The new Pharmafill(TM) CP3 Cap Press semi-automatic bottle capper from packaging machinery manufacturer Deitz Co., Wall, NJ (www.Deitzco.com), presses press-on- and snap-on-style caps onto bottles quickly and easily. Developed to replace a slow and physically demanding manual process capping one bottle at a time by hand, the new CP3 Cap Press presses up to 12 caps at a time in seconds, speeding production and eliminating ergonomic concerns without requiring a costly, high-volume, automated capping machine. The clever CP3 Cap Press features a novel approach whereby the filled bottles are set in a magazine, then placed under the press plate. At the push of two buttons at the same time, the bottle capper presses caps onto all of the bottles, then the magazine may be removed and reloaded. Multiple magazines may be used and/or pre-loaded for even faster production. Ideal for capping bottles of vitamins and nutraceuticals, creams and lotions, cosmetics, and other products in modest volumes, including bottles with odd shapes that confound conveyor-fed capping machines, the portable CP3 Cap Press measures 19 inches across x 8 inches deep x 16 inches in height for easy setup on a desk or tabletop and quick removal for storage. 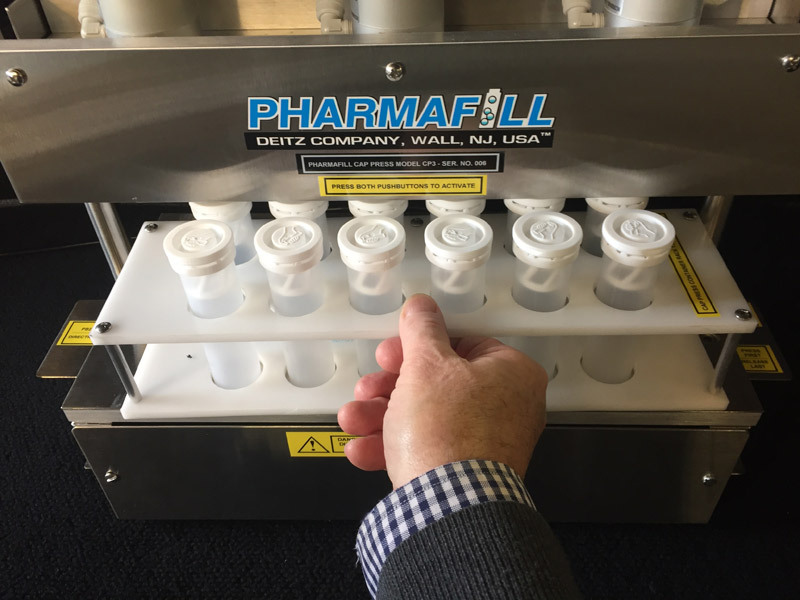 The Pharmafill CP3 Cap Press operates with compressed air at 100 PSI and requires no electricity. It is manufactured at the company’s Wall, New Jersey headquarters.